Mango which happens to be one of my favourite tropical fruit is in season now. As I still have some leftover mangoes after making the Mango and Pistachio Friands last week, I moved on to make this yummy Mango Pomelo Sago Dessert. I didn’t use coconut milk, evaporated milk or whipping cream to make this dessert but used mango juice (store bought) and fresh mangoes instead. An easy method to combine everything together. So good to have a bowl of this cool refreshing mango pomelo sago dessert especially to beat the scorching hot weather. Rinse sago pearl under running water in a sieve till water runs clear. Drain well and pour into a pot of 800ml water boiling water. Let it keep boiling for about 5 minutes and turn off the heat. Cover the sago pearls with a lid for another 5 minutes or until you see the sago pearls become translucent. Pour out sago pearls into a sieve and rinse with cold water, drain well. Blend 300g mango and mango juice to smooth puree. Combine squeezed orange juice and blend well again. 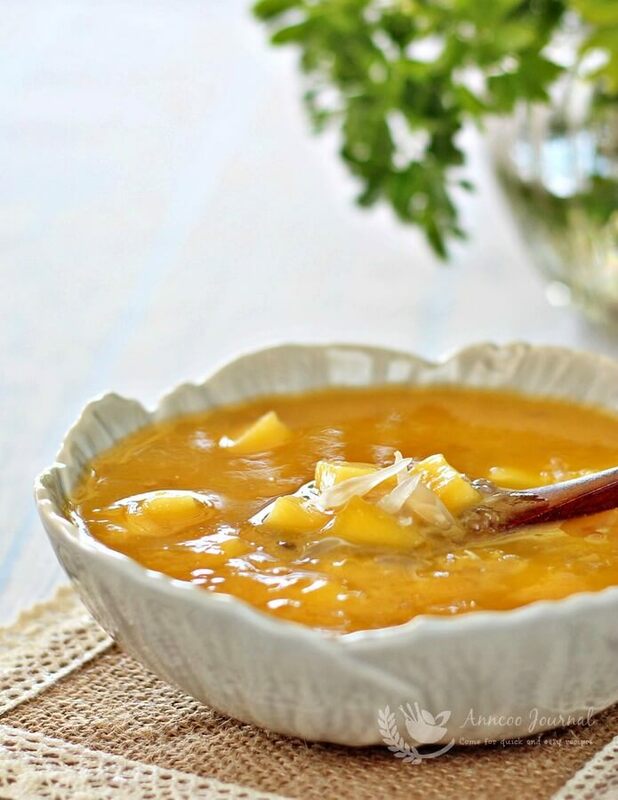 Combine mango mixture and sago pearls together in a large bowl or jar, stir well. Chill in the fridge for 2 hours or more. To serve, pour mango dessert into individual serving bowl. Add about 2 tablespoons or more of mango cubes into it with pomelo pulps. 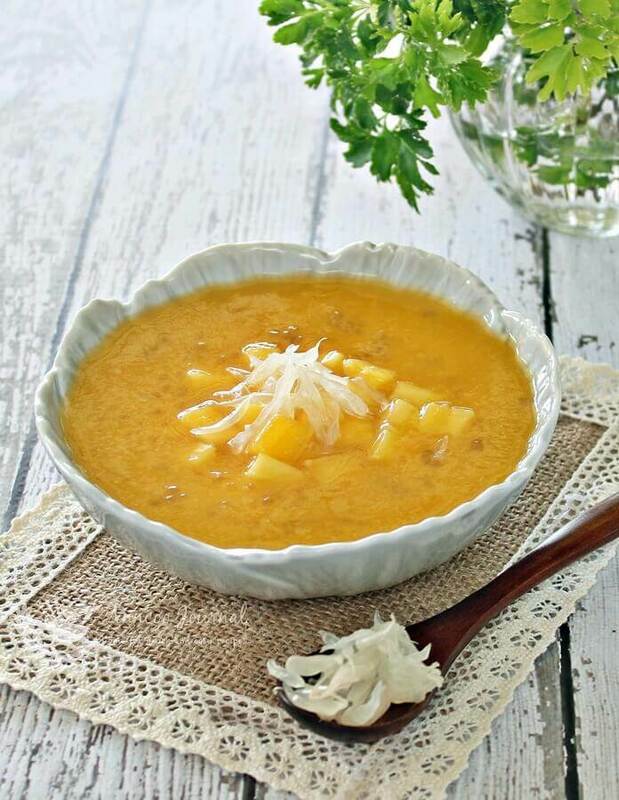 For quicker way, you may also combine the mango cubes, pomelo and sago together with the mango puree and chill. Enjoy & Hope you have a Wonderful Weekend Ahead! Look totally fantastic! Both photos and recipe! this is my favorite dessert, so nice to have a bowl now. Hi Ann, this dessert is refreshing. Oh yes it's mango season and thanks for sharing. Enjoy your weekend too ^-^! Wow, this is truly a delicious thirst quencher, Ann! Just the thing for the scorching hot weather, how i wish it could appear in front of me right now! I am a HUGE fan of this dessert!!! I miss it so much! Thanks for sharing the recipe. I can't wait to try this! Hi Ann, this is also my favourite and just nice for the hot weather.. Totally refreshing and good for you too! I loved mango but unfortunately they are out of season now. Your mango dessert looks so tempting and refreshing with mango juice instead of coconut milk. Good morning Ann! Looking at your dessert I would raise my hands & feet to become your guest, haha! Mango isn't in season here now & how I wish I can have your mango pomelo dessert! Last time I used pineapple juice. Next time may be I should try the mango & orange juice. Our favourite! Unfortunately I cannot eat now coz of a cough.